A simple housecat named Simon encounters some bigger cats: Lion, Puma, Panther, Tiger, and Cheetah. Each of the big cats has something to say about Simon not being “cat” enough. According to them, he just doesn’t measure up. He doesn’t have Lion’s mane or Cheetah’s spots. He doesn’t sleep in trees like Panther or climb mountains like Puma. He’s small and fuzzy, not big and strong. But ultimately, Simon shows the big cats that he’s just like them . . . only smaller. Galia Bernstein was born and raised in Israel. She started her career as a designer and illustrator for the Israeli Army’s magazine. She later studied illustration at Parsons School of Design at the New School and now works as a full-time freelance illustrator. She lives in Brooklyn. "Bernstein’s debut is a fresh, powerful twist on the tension between in-groups and out-groups. The big cats threaten, but her hero shows no signs of compromise or apology. And her spare, clean artwork shares the same sense of certainty." "Bernstein’s debut is fun, well crafted, and promising. The simple text and strong pictures offer an amusing read-aloud for small groups or individual children." 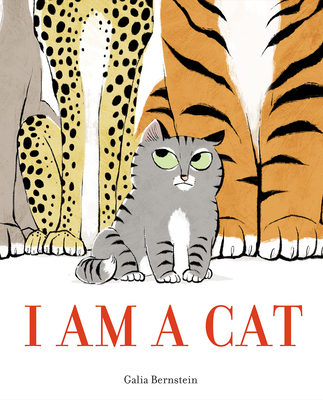 "Witty language and delightfully bold digital illustrations with hand-painted textures elevate I Am a Cat from a read-once picture book to an experience that children will want to explore multiple times." "Simon helps everyone realize that, though he’s smaller than the rest, he’s a cat all the same. This straightforward concept is entertainingly executed in accessible, humorous sentences, while the digital and hand-painted animals prowl, prance, and play in a variety of perspectives that perfectly prove Simon’s point." "Bernstein's distinct, slightly cartoony characterizations of her array of big cats are both educational and entertaining. The big cats are indeed large and toothy, but the portrayal is ever lighthearted. Clever." "There’s a touch of genuine biology in this low-key humorous text, which has a pleasing folkloric structure and formality in its tone. Bernstein’s soft-edged digital illustrations will delight cat lovers."